If you prefer the charm of authentic wood shakes or slate tiles for your home, without compromising your budget, GAF’s Ultra-Premium Designer Roofing Shingles is the top choice. This top-of-the-line shingle series offers you the luxury you can afford. These shingle products come in a range of specially formulated color palettes to accentuate the natural beauty of genuine wood shakes and slate tiles. Their realistic wood and slate appearances lend a deluxe look to your home for decades. Best of all, these shingles will stay stunning without aging. This roofing in Danbury, CT, is reinforced with GAF’s StainGuard® and Advanced Protection® Technology. The former protects your shingles against the unsightly blue-green algae, while the latter increases their granule adhesion. 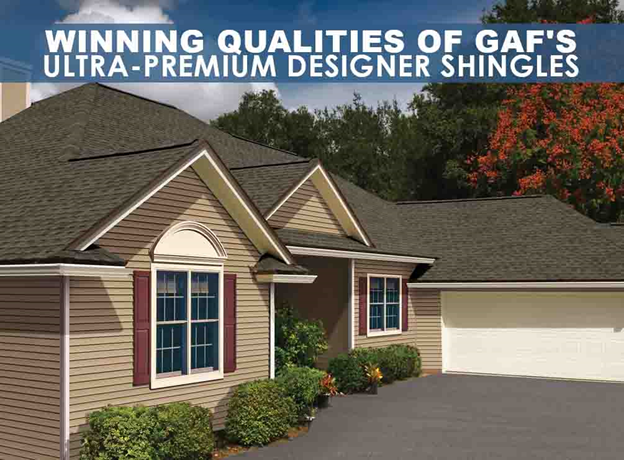 GAF’s Ultra-Premium Designer Shingles are as tough as they are gorgeous. After 185 individual tests, these premium shingles with Advanced Protection Technology have been proven to deliver outstanding wind uplift and fire resistance. Whether you pick the Camelot® or the Glenwood®, GAF’s Dura Grip™ Adhesive seals your shingles tightly, allowing them remain in place and withstand 130 mph–winds. As proof of its unfading beauty and long-term durability, any Ultra-Premium Designer Roofing Shingle paired with other key components comes with GAF’s top-tier guarantee, the Golden Pledge® Ltd. Warranty. This powerful warranty covers material defects for 50 years and workmanship-related failures for 25 years. It’s only provided by Master Elite™ roofing contractors in CT, like Vinylume. This ensures your installation is done to perfection. Let’s get your project started! Call us now at (866) 244-8029, and schedule your free in-home consultation.